We just finished adding 3 new Conveyor White Papers, including helpful information on Critical Product and Load Orientation, a Picking, Packing and Loading Application Matrix, and Sortation System Controls Comparisons table. Push back rack systems are excellent high density storage solutions — perhaps the most economical way to squeeze space out of a crowded warehouse. All loads are stored and retrieved from the same aisle. This reduces the number of aisles needed in a facility, freeing up more space for storage. Aisles can take a great deal of space up in a typical warehouse, so by implementing a pushback pallet rack system, you essentially swap selectivity for space. Push back rack systems provide a Last-In-First-Out (LIFO) inventory rotation, so you have to be certain your load fits. If it does, congratulations — you’ve just saved a lot of space. 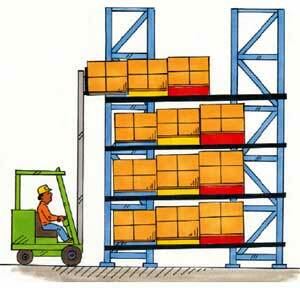 But there are issues that can arise when pushback rack is inappropriately specified or utilized. Many operations utilize pallet or slip-sheet to convey bulked material, whether in manufacturing, work in process, to convey from a palletizer, or in shipping areas. While some applications require these palletized items to only be carried the last few feet of their process, many rely solely on the pallets to carry their product throughout a facility. Today’s processes require a smarter and often unique footprint for these palletized items. However, historically these unique footprints have been difficult for the material handling, namely conveyors, to handle effectively.